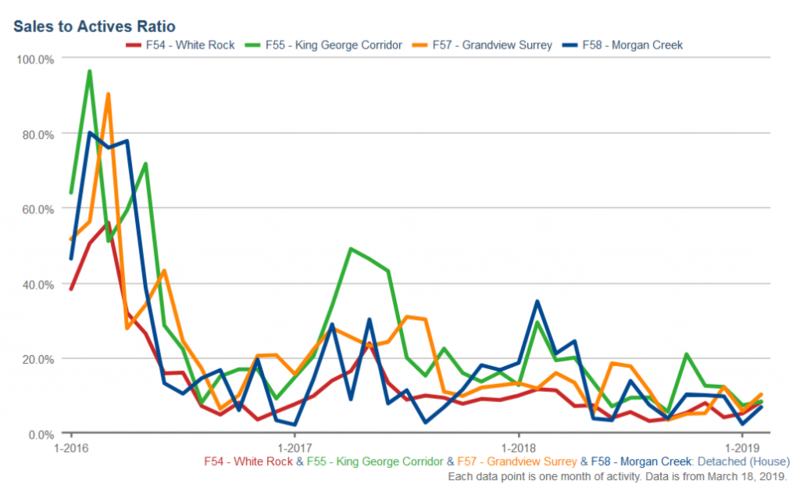 Demand for higher end homes throughout the region remains low, which means South Surrey/White Rock continues as one of hardest it markets in the Fraser Valley. Despite the low demand, benchmark prices for single family homes & apartments reversed their 8+ month trend of declining prices. 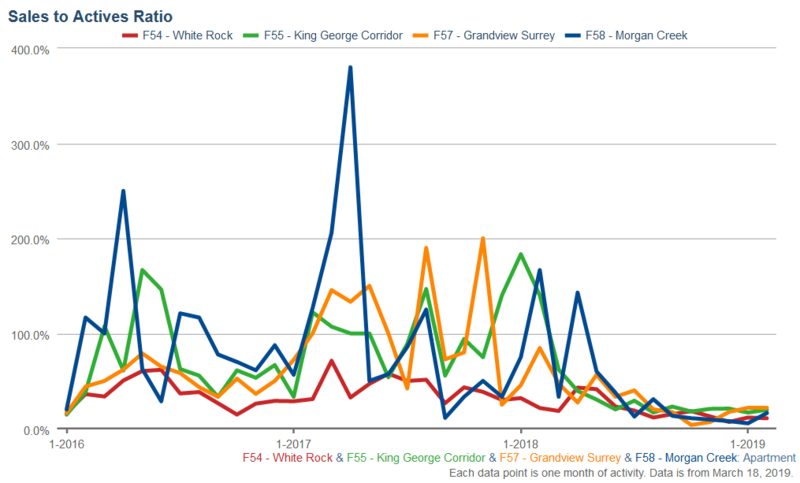 The “typical” South Surrey/White Rock home peaked earlier than most areas in the Fraser Valley, reaching $1,523,7000 in July 2017 and appears to have reached its lowest point since 2016 just this January at $1.351m. The benchmark value for the area jumped back up to $1,382,800, bringing values back to pre-winter figures. 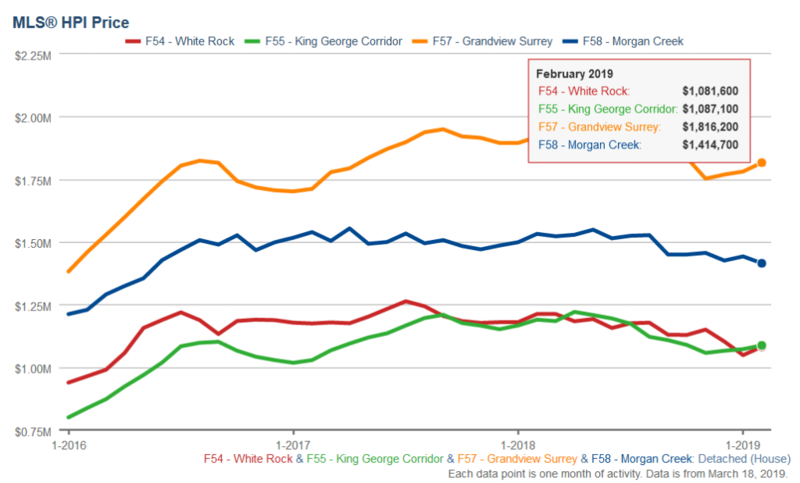 The Morgan Creek area continues to see falling prices, White Rock proper and Grandview made significant gains (see graphs below). While the sales to listing ratio in the area improved from the very weak 4.1% in January, it was still only 6.5% in February. Of the four major sub-neigbhourhoods, Grandview favoured sellers the most with a sales to listing ratio of 10.2%, which is still a strong buyers market. Click to view South Surrey/White Rock single family homes! With only 13% of listing townhomes selling in February, the townhouse market continues to favour buyers and prices are showing it. 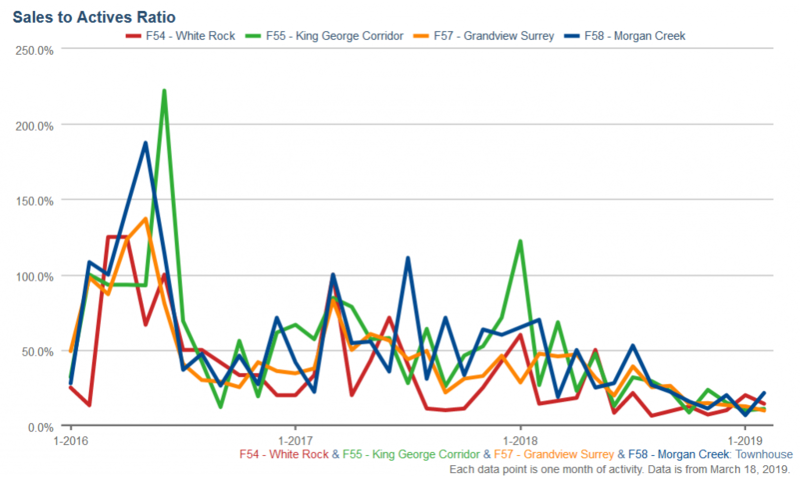 While South Surrey/White Rock benchmark prices hit a high around the $690,000 mark back in April 2018, prices have held better than most other markets, coming down to only $675,000 by December. However, February took a significant hit, posting a benchmark value of $646,400 (-1.5% compared to last February). While these are the highest townhomes prices in the Fraser Valley, sellers are struggling to find buyers. 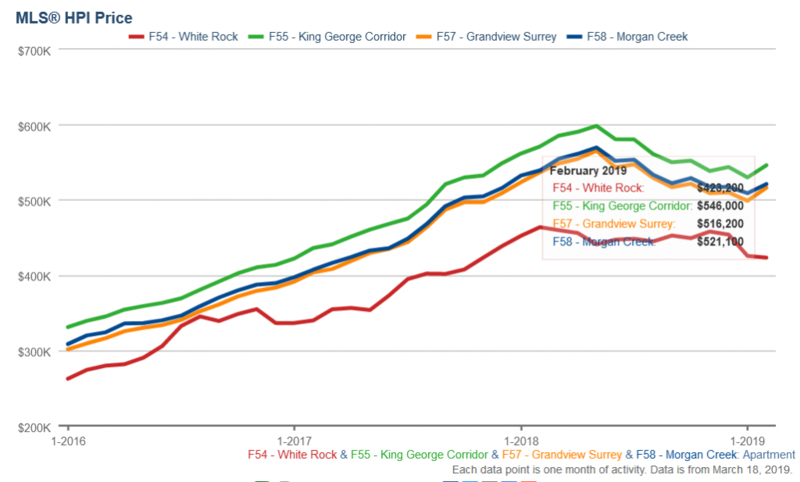 Grandview and Morgan Creek townhomes didn’t take too much of a price hit, whereas White Rock and the King George corridor had a hard one month correction. The latter, in particular, dropped from $706,200 to $667,000 in one month. Click here for South Surrey/White Rock Townhomes! The over-saturation of apartment condos in White Rock is really starting to show as White Rock prices are contrasting South Surrey trends. While the combined sales to listing ratio in the area is a healthy 17%, the City of White Rock itself only sold 10.7% of its inventory. This strong buyers market has pushed White Rock benchmark values from $454,000 in December 2018 down to $423,200 this February. 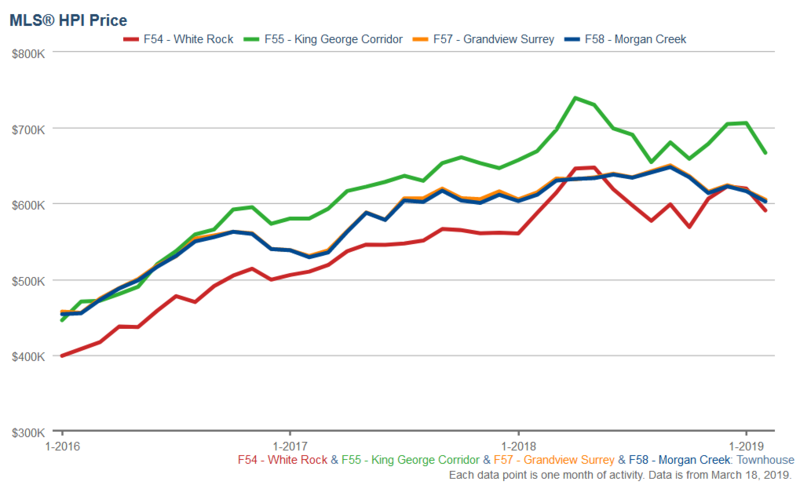 Meanwhile, the King George Corridor, Morgan Crossing and Grandview all posted gains (see graph below), lifting prices in South Surrey/White Rock back up to $488,800 from $481,000. While this isn’t quite at pre-winter values, it does show a positive trend. The main cause of concern for White Rock proper is that listings have shot through the roof, meanwhile sales are stagnant. This is putting a lot of pressure on sellers. The problem for homeowners is that they are also competing with a lot of new condo inventory – much of which isn’t even showing on the MLS. View South Surrey/White Rock Homes here!